As reported here, Hugh Jackman has previously had 4 Basal Cell Carcinomas removed from his shoulder. The world is full of celebrities that just want to milk the limelight and give nothing back, particularly wanting to appear bullet-proof and “special”. So the fact that Hugh is going public with his skin cancer issues in order to highlight the necessity to get regular check ups is to be applauded. Hugh is 47 and his life in the sun would be very similar to most other people here in Queensland. He probably played sport,surfed,worked outdoors with limited sun protection either from sun cream, a wide brimmed hat or clothing. He grew up in an era where the effects of the Australian sun were not fully understood and his recent skin cancer discoveries are a result of that period of overexposing his skin to the sun. Hugh has just gone public again with his 5th melanoma removal and again reiterated the need for regular checkups, the ABC report is here. The Queensland sun is the most harmful within Australia hence it is the skin cancer capital of the world, Hugh grew up in NSW and even has some Greek blood(olive skin DNA) so he is by no means a prime candidate for skin cancer. 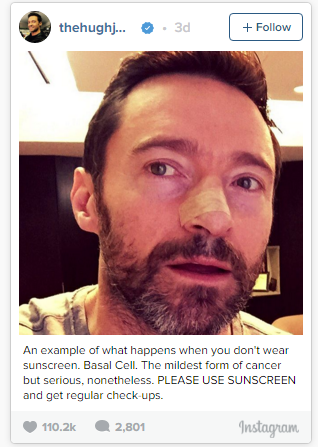 In November 2013, a Canadian makeup artist alerted Australian actor Hugh Jackman to a small red spot on his nose. 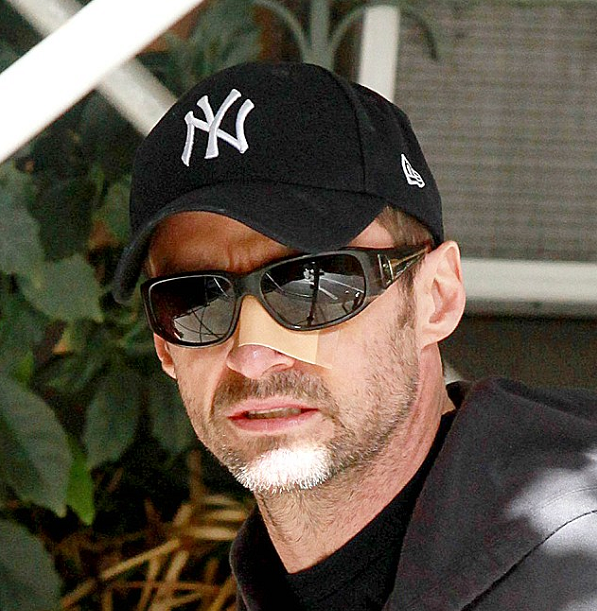 Jackman’s wife, Deborra-Lee Furness, urged him to get the spot checked and that’s when he was told he had basal cell carcinoma (BCC). Skin cancer is the most common form of cancer in Australia and accounts for 80 per cent of all cancers diagnosed each year. Basal Cell Carcinoma, the type Jackman contracted, is a non-melanoma skin cancer which is the most commonly diagnosed cancer in Australia. All together, Jackman has had four skin cancers removed in the last 18 months, three from his nose and one from his shoulder. In an Instagram post, he also told his followers, “Please don’t be foolish like me. Get yourself checked. And USE sunscreen!!! “. Jackman has since teamed up with a sunscreen brand in the US and launched an affordable sunscreen line for kids, Pure Sun Defense.